Hydrogen seems almost aware of its illustrious history, for the atom behaves in a regal fashion. All of us, from infant to most senior, are aware of the world around us. The breadth and depth of this awareness varies dramatically from person to person, but the same world is there for all to observe. When we look not only with our eyes, but also with our minds and souls, we can see very different worlds. For example, we might interpret the world as diverse: each face in a throng of people is unique; each letter of the alphabet is explicitly different; each planet in the solar system has a distinct size and a definite orbital location in the Sun's family of satellites. On the other hand, we might look at the same world and see unity: the eyes, nose, and mouth together possess the corporal unity that is the human face; the alphabetical letters in proper sequence have a functional unity as a language; and the planets—regardless of size and composition, regardless of distance from the Sun—exhibit a spherical shape and travel along a circum-solar elliptical path that manifests the unity of physical law. 1850), the answer was unity and that unity, he claimed, was based on the hydrogen atom. Prout's idea of an underlying unity for all matter originated during his student days. The influences that prompted this mindset cannot be identified with certainty. Was its origin religious? Prout, a deeply religious man, wrote the treatise On the Power, Wisdom and Goodness of God, as Manifested in the Creation. Was it music? Prout was an accomplished organist. Was it medicine? Prout was a physician who specialized in urinary and digestive disorders. Was it the work of other scientists? He was especially influenced by the works of British chemists Sir Humphry Davy (1778-1829) and John Dalton (1766-1844). Whatever the origin of his conviction, Prout hoped to develop a more analytical, unified chemistry. He thereby joined scores of other scientists whose approach to their science was strongly influenced by deeply held convictions about the correct way to seek an understanding of natural phenomena. Prout believed that a primordial substance—some basic stuff— lies under the diversity of the material objects comprising the universe, and that this basic stuff is hydrogen. The idea of a primordial substance was not new. Thales, who lived on the isle of Miletus some 2,400 years earlier, had concluded that water was the basis of the manifold forms of all material objects. Never mind that he was wrong. Thales' idea was extremely provocative. The original Greek atomists, Leucippus and Democritus, who lived and thought about the world a century after Thales, continued the same intellectual quest to identify the underlying unity of matter. Through the centuries and to the present day, the quest continues. Prout was a part of that tradition. By the time Prout received his medical degree from Edinburgh University in June 1811, chemists were flirting with the idea of atoms. No one had seen an atom, no one knew the nature of an atom, and there were reputable scientists who rejected the idea of atoms altogether. Chemists did recognize, however, that certain substances possessed established properties that defined their identity. These substances were the chemical elements. Whether or not the basis for their distinct identity was atoms, however, remained unresolved. During the early years of the nineteenth century, Dalton transformed atomistic philosophizing into atomic experimentation and thereby amassed evidence that eventually provided strong support for a fully credible atomic theory of matter. Prout, a contemporary of Dalton, was one of these early experimental chemists. At that time there was no periodic chart of the chemical elements and many of the elements had yet to be discovered. However, some forty elements were known—a sufficient number to prompt a man of Prout's passion to seek unity in this diversity of chemical elements. In the tables he developed to organize his results, Prout applied his ideas to forty-two elements. The atoms of each chemical element are characterized by a definite weight: the atoms of any one element all have the same weight, but the atoms of some elements are heavier than those of others. Oxygen atoms, for example, weigh more than those of nitrogen. The hydrogen atom, the simplest of all atoms, weighs the least. If, Prout reasoned, hydrogen was the fundamental building block of all the heavier atoms, then the atomic weights of all elements should be exact multiples of the atomic weight of hydrogen. This is what Prout set out to prove. Prout did not consider himself a proficient experimentalist; nonetheless, he designed and carried out experiments to determine the weights of such atoms as iodine, phosphorus, sodium, iron, zinc, potassium, and beryllium. For other elements he accepted the atomic weights that had been measured by scientists he considered trustworthy. Of critical importance was the atomic weight accepted for hydrogen itself and for this Prout used the value measured by Davy. With these data in hand, Prout pro ceeded to show in a table that the weights of the heavier elements were exact multiples of the weight of hydrogen. For example, the weight of carbon is twelve times the weight of hydrogen, the weight of nitrogen is fourteen times the weight of hydrogen, the weight of potassium is forty times the weight of hydrogen, and the weight of iodine is 124 times the weight of hydrogen. And so it went with the other elements Prout examined. For him the results were convincing. "Others [chemical elements] might doubtless be mentioned," concluded Prout in his 1815 paper, "but I submit the matter for the present to the consideration of the chemical world." In 1816 Prout anonymously submitted his paper and a follow-up paper each with the same title, "On the Relation Between Specific Gravities of Bodies in the Gaseous State and the Weights of Their Atoms. "1 Soon after, Prout identified himself as the author of these two papers and his idea became known as Prout's hypothesis. Prout delivered his hypothesis into a scientific world whose practitioners held opposing views as to how one should approach the study of the chemical elements. On the one hand, there were those who thought that chemists should focus entirely on the facts that came out of careful experimentation and avoid hypothetical speculations about the deeper nature of matter. Representing this point of view were such first-rate chemists as Dalton and the Swedish chemist J. J. Berzelius (1779-1848). On the other hand, there were those for whom the lure of a generalization that could unite the elements into a coherent theory of matter was enticing. Physicists generally fell into this latter group along with some physically minded chemists. Michael Faraday, for example, said to William Crookes, "To discover a new element is a very fine thing, but if you could decompose an element and tell us what it is made of—that would be a discovery indeed worth making. "2 Many scientists of the nineteenth century, like William Herschel and James Clerk Maxwell, believed that "atoms bear the impress of manufactured articles. "3 The question to be answered was, "What is the raw material from which these 'manufactured' atoms are made?" Prout believed it was hydrogen. The first hint of the actual raw material out of which atoms are constructed came with the discovery of the electron by J. J. Thomson in 1897. Then Ernest Rutherford, fourteen years later, discovered the atomic nucleus. 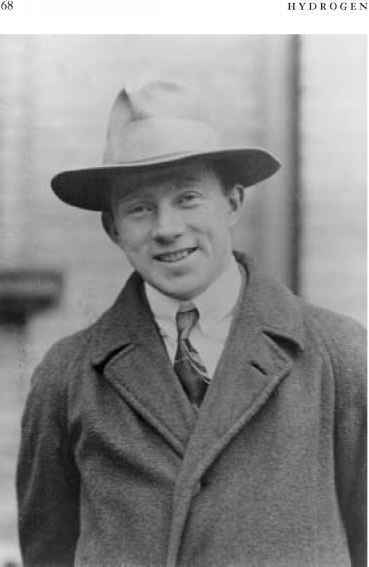 After Rutherford's 1911 finding, the idea that atoms were made of negatively charged electrons and a positively charged massive core quickly gained widespread acceptance, and further discoveries followed rapidly. But first, we must back up a few years to pick up another strand of history. In 1896, the year before Thomson discovered the electron, Antoine Henri Becquerel discovered radioactivity. With this finding the long-assumed immutability of atoms became untenable. For the next decade and more, many physicists analyzed the decay products of atoms and by 1910 found that the decay products of radioactive atoms involved "daughter" atoms that were some times chemically identical to the "mother" atom, but differed in their atomic weight. Such atoms—identical in their chemical behavior, but different in their inherent physical character—were called isotopes in Frederick Soddy's 1913 paper in Nature.5 Were isotopes a consequence of the radioactive process or were isotopes more general? In other words, did nonradioactive atoms also come in different isotopic species? The Great War delayed the answer to this final question, but during the war, Thomson conceived of a new instrument that would, he thought, allow the masses of atoms to be measured with unprecedented accuracy. After the war, Thomson's colleague Francis William Aston built the first "accurate" mass spectrograph and showed in 1920 that the stable element neon had two isotopes with atomic masses of twenty and twenty-two. As additional elements were analyzed by Aston's technique, it was established that the atomic weights of heavy elements were not exactly whole-number multiples of the atomic weight of hydrogen. Prout's intriguing hypothesis was proven false by the accumulation of incontrovertible evidence gathered at the laboratory bench. Hydrogen, the heroine of this book, was not destined to be the fundamental building block of all other atoms. But in 1815 the simplicity of hydrogen made it the most obvious candidate for an empirical theory of matter; thus, hydrogen stimulated an idea that transcends the details that gave the idea expression. The question articulating the idea is eternally seductive: Is there some irreducible basic stuff at the foundation of the material world? Thales' proposal of water was wrong; Heraclitus' answer, fire, was also wrong. The four elements of the ancient world—earth, water, air, and fire—proved inadequate. Prout's hydrogen, after decades of accumulated evidence, could not be supported as the answer. The electron and the proton, for a while, seemed to provide the holy grail of matter; but under close examination, protons lost this privileged status. What is the basic stuff? Is the answer electrons plus the quarks and gluons that make up the proton and neutron? No one knows with absolute certainty, but the quest continues. And the quest is driven by the same powerful urge that compelled Thales and Prout to see unity in the diversity of the material world. It was the same urge that brought Isaac Newton to see unity in movement on Earth and those quiet motions we observe in the night's sky; it was the same urge that brought Maxwell to see the diverse behaviors of electricity, magnetism, and light exhibiting such a unity. In his synthesis, Maxwell captured this unity. Contemporary physicists seek a similar sort of unity among the four basic forces that they believe account for all the physical pageantries we witness in the observable universe. The quest for unity is a staple of physics. In the chapters that follow, we shall see that the simple hydrogen atom has been a vital presence in that quest.